Nowadays, a lot of pants model rise among women in Indonesia. The number of outstanding design pants are not uncommon among the women to choose a pair that suits them. If you are facing the same problem, the following tips is our review of pants that fit for you. We won’t let you to choose the form of pants that do not fit your posture, because instead appear fashionable, your appearance will actually look less than perfect. For those who have a short torso, Ceramic body shape with rise or hipster pants hanging low on the hips. This makes the illusion of a longer body shape. You can also choose pants with detail on the hips to form a silhouette of the body or use a thin belt. For women hipped, intersected pants with waist medium rise (approximately 2 cm above the hips) with models straight, flare, or palazzo can balance the lower body is wide and gives the impression streamline. Choose dark colours and avoid low-rise pants models and accent pockets on the buttocks that make big hips became more focused. You can cover large thighs with pants that fall straight from waist to ankles. Wide pants are also able to disguise the “excess” in the thigh. Pants with visible seams on the side can make thighs look slimmer. Avoid pants that are too tight and the narrower at the bottom. Pants with straight loose models (make sure there is tight at the calf) is able to help disguise a large calf. 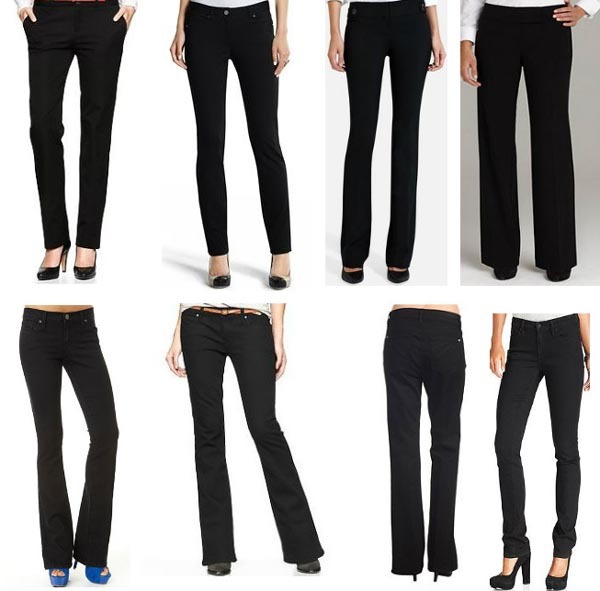 If the hips and thighs tend to be slim, boot cut pants will make the appearance look charming. Avoid skinny pants or pants three-quarter falls right in the middle of the calf. While the problem of short legs can be covered with a pair of skinny models or straight to create the illusion of a higher body. High-waisted trousers or a model that has a vertical crease line (the former board) at the front could also make the legs look more level. Instead, avoid pants with an accent crease on the bottom, baggy, cropped, and culottes pants that are too long because the body is getting short sighted and “sinks”. You can also combine the pants with high heels to look more level. If you wear flat shoes, wearing a pointed end. People with long feet and ladder should be proud because almost all models trending pants worn is appropriate, ranging from fitted, baggy, bell bottom up. However, make sure the pant length up to about 1 cm from the feet. If do not want to stand out, choose cropped pants, baggy, or straight pants folded a little wide at the bottom. For a solid match, apply the principle of balance in order to look perfect appearance. Try wearing boxy shirt or jacket when wearing pants or tops fitted models fit the body while wearing palazzo pants.